Evan Blass, formerly known anonymously as evleaks, has posted a photo of what he says is the Samsung Galaxy S6 Edge Plus with a new keyboard case. 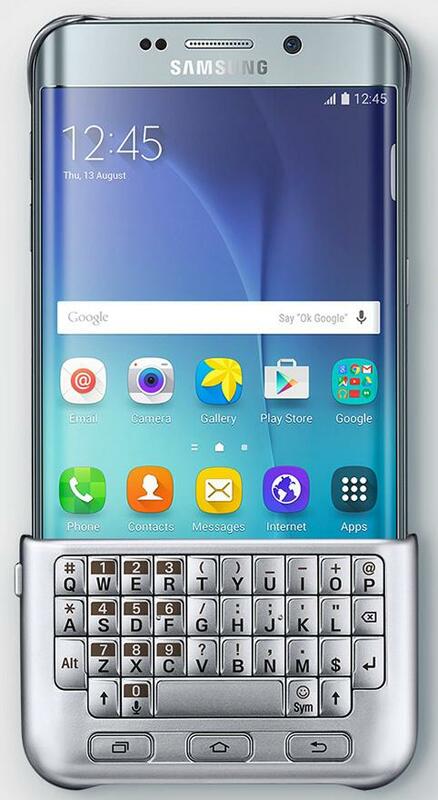 Not sure if the picture is of the actual keyboard case or just a mockup, but it is a new approach from Samsung. On August 13th, Samsung is holding their Unpacked event where they are said to reveal the Galaxy Note 5 and Galaxy S6 Edge Plus. Maybe we will see a new keyboard accessory as well? From the looks of it the case seems to be the standard Samsung Clear Cover case that they released for the S6 Edge, but now the keyboard attaches to that. There is also a little button on the top left of the keyboard which I would assume is to take it off. Also, the keyboard covers the bottom half of the screen and has had to add a multitask button, back button, and of course home button. Since the case is blocking the home button I guess that means no fingerprint reader capabilities while it’s on? What do you think? Are you feeling a keyboard case or should they just stick to the normal on-screen keyboard? Tell us in the comments below.